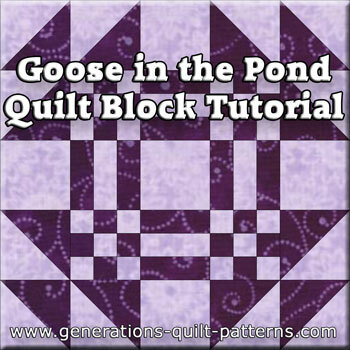 A Goose in the Pond quilt block is much simpler to make that it looks at first glance. 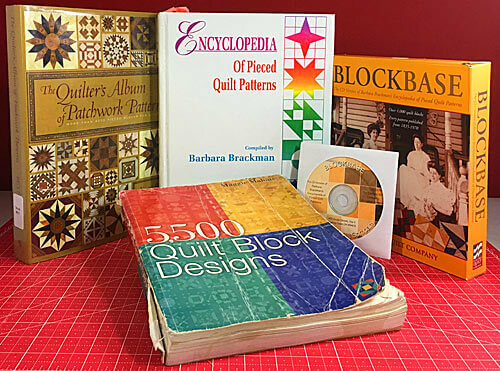 It's a wonderful block to practice the basics—9 patches, quick pieced half square triangles and Rail Fences—blocks you learned to make in our Beginner Quilt Blocks series or other beginning quilting classes. Like so many blocks, this one has many aliases which include: Gentleman's Fancy, Geometric Garden, Mrs. Wolf's Red Beauty, Patchwork Fantasy, Scrap Bag, Unique Nine Patch, and Young Man's Fancy. All seam allowances (SA) are 1/4" and are pressed toward the darker fabric unless otherwise noted. I choose to pre-wash and starch my quilt fabrics before cutting. This removes any dirt and gunk left from overseas shipping or the quilt shop and makes the fabric especially easy to sew with. 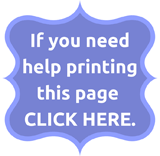 As the block size increases, you can use larger and larger prints more effectively. For a 7-1/2" Goose in the Pond, I suggest using fabrics with small scale patterns or tone-on-tones that 'read' as a solid or just plain solids. That way you don't loose any of the points in this patchwork design. Strips for the Rail Fence and 9-patches are cut 1" longer than needed so you can straighten the edges for cutting. 1 Background	 5	 2” x 2”	 3½" x 3½"	 6½" x 6½"
2**	 Background	 6	 2⅜" x 2⅜"	 3⅞" x 3⅞"	 6⅞" x 6⅞"
3**	 A	 6	 2⅜" x 2⅜"	 3⅞" x 3⅞"	 6⅞" x 6⅞"
Unfinished Block Size	 8”	 15½"	 30½"
Trim HSTs to...	 2” x 2”	 3½" x 3½"	 6½" x 6½"
**I added an extra ¼” to these patches and then cut them, i.e. for the 15" finished block the 3⅞" x 3⅞" square was cut at 4⅛"x4⅛”. After stitching the HSTs are trimmed to the measurement in the 'Trim HSTs to...' row. Since we're using the Quick Pieced Half Square Triangle method, mark a diagonal line on the back of the light #2 squares with a pencil. Layer a marked #2 and a #3 square with right sides together (RST). Stitch a 1/4" away from the line on both sides. 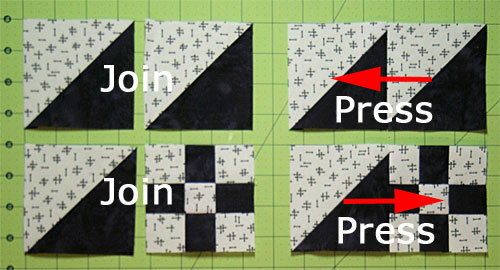 For larger squares, it's helpful to pin the layers together to keep them from shifting as you sew. I like to use my standard quarter inch presser foot for this step. 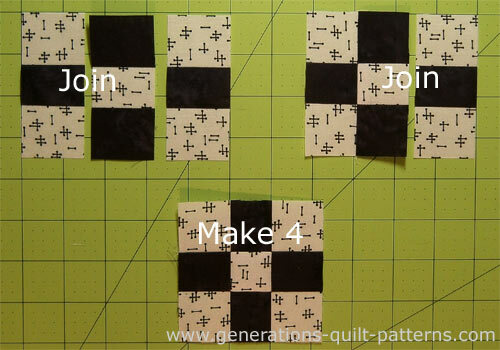 Cut each pair of squares apart between the two lines of stitching. Press, with SA to the dark. If you cut your patches oversized, you'll need to trim them. 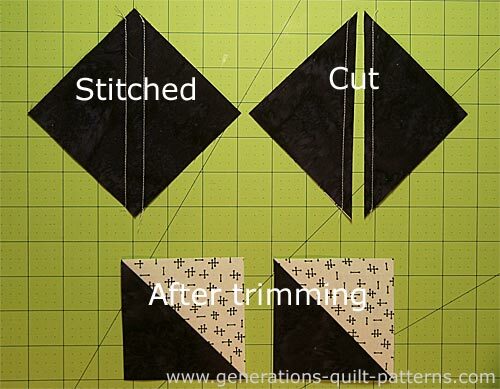 Use the 'Trim HSTs to...' row in the Cutting Chart to find this measurement. 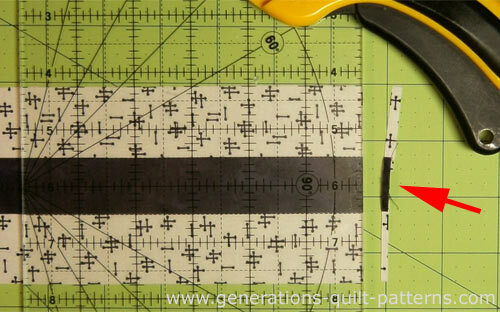 If you cut your patches exactly as listed in the chart, the finished HSTs should equal this same measurement. 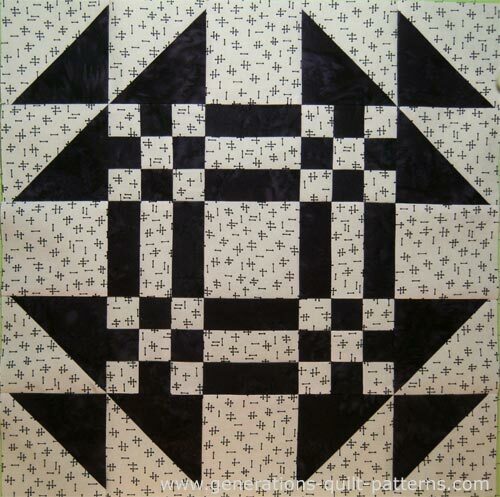 Repeat for the remaining #2 and #3 squares for a total of 12 HSTs. For this step, you can see in the photo below that I've switched to my 1/4" foot with a guide. 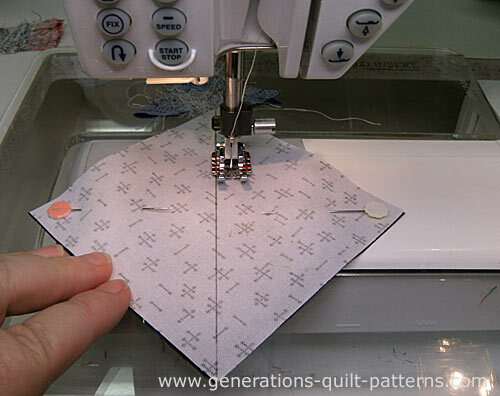 Between this guide and using starched fabric, sewing a perfect quarter inch SA is a breeze! With RST stitch the #4 and #5 strips together. I prefer to press after adding each strip because it's so much easier. 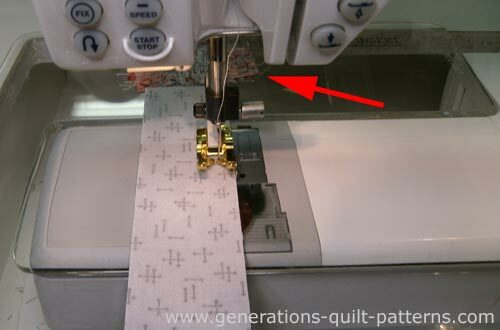 If you find yourself frequently getting tucks at the seam allowance try fingerpressing the seam allowance before using your iron. 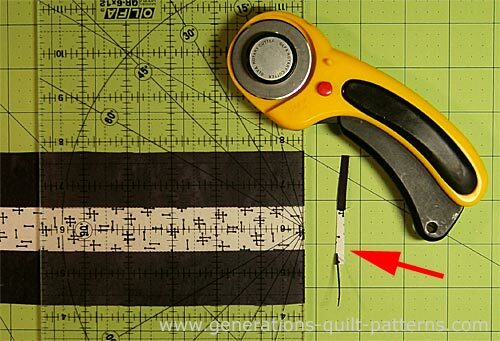 Sewing with my quarter inch foot with a guide—perfect for piecing strips! Add the third strip, alternating lights and darks. Press. 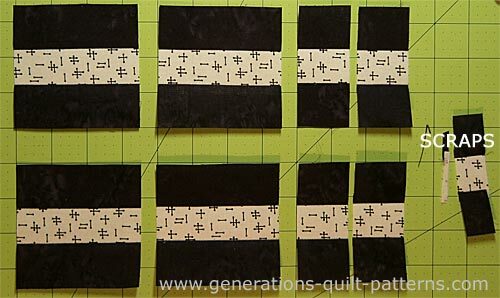 Straighten one short edge of the #4/#5/#4 strip set by aligning a line on your ruler with one of the seam lines. Trim away only as much as needed for a straight cut. Using the chart below, find your Goose in the Pond's finished size. Subcut the needed patches. After subcutting, we have 4 Rail Fences (left), four centers for our nine-patches in the next step and a wee bit of scrap. With right sides together, stitch the #6 and #7 strips together. Alternate light and dark. Press after adding each strip. Using the chart below, find the finished block size. Make your subcuts. These are the patches with just a bit left over. Lay out two #4/#5/#4 and a #6/#7/#6 as show below. With RST stitch one of each together, press with the SA toward the center. Add the remaining #4/#5/#4. Press again with SA to the middle. 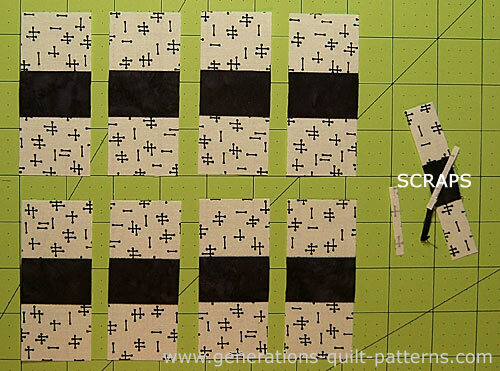 Repeat with the remaining units to make 4 nine patch blocks. We assemble our Goose in the Pond as an uneven 9 patch. To do so, first we much construct corner and side subunits. Each corner is stitched and pressed exactly the same—I promise, the seams will nest for easy matching. With RST, stitch two HSTs together, pressing the SA toward the dark. With RST, stitch the dark edge of a HST to a nine patch, pressing the SA toward the nine patch. Press the seams in the direction of the red arrows. With RST, join the two units together to form a corner. The seams nest. To make sure the points match, I always use pins. My favorites are IBC's Glass Head Silk Pins. They are 1-3/8" long with a glass head and a super-fine 0.5mm shaft. Because they're so fine, there's little distortion when you pin match your points. Yes, they ARE expensive as pins go. Yes, you will need to replace them periodically. Since they're so fine, they will bend over time. However, they ARE the perfect pin for the job. To finish this corner unit, press with the SA toward the nine-patch. Repeat for a total of four corners. With RST, stitch a #1 background square to the dark side of a Rail Fence unit. Press the SA away from the Rail Fence. 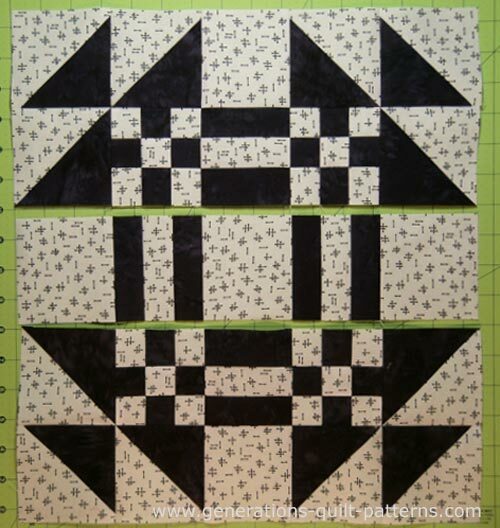 Lay out the corners, sides and cut patch into three rows—this is an uneven 9-patch formation—to form the Goose in a Pond design. Stitch the pieces in each row together, pressing the SA toward the Rail Fences...in on the top and bottom rows and out in the center. And finally, stitch the three rows together. After one final press (check out this wickedly simple pressing technique—it tames even the lumpiest of blocks!) your Goose in the Pond quilt block is finished! Like most quilters, once your most recent quilt is bound, you're surely itchin' to start the next one. 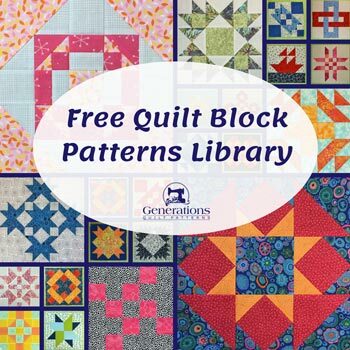 Use our Free Quilt Block Patterns library to help you brainstorm for your next project.